All NCompassTrac products are engineered for mobility, speed and ease of use. No software installation or downloads are required and all products work standalone or together in our Cloud. Cloud based loyalty rewards program in a box. Provides the ability to capture new and build a bond with existing customers that will insure a lasting business relationship built on valued mutual benefit. 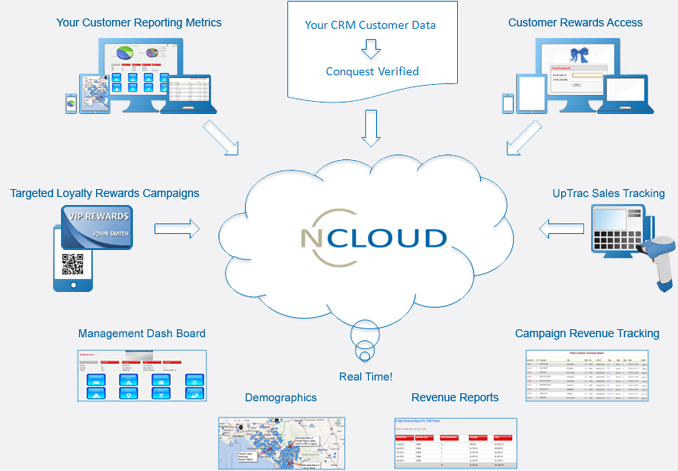 Designed to give you a 360 degree view of your current business and produces a game plan to retain, capture, conquer new and recover lost customers. Customers in the digital age expect real-time response and have higher expectations of chosen brands. Capturing information at the point where it originates, and delivering this information to direct and indirect sales or enterprise applications such as CRM will accelerate the decision to purchase time. For the brute force old schoolers, a tried and true Savings and Gift Card program with real time revenue performance tracking. NcT TracPay is a complete Ground to Cloud on premise electronic Payment System that utilizes the latest in Card, Scan, QR and barcode technology to control the entire commerce cycle of any event looking to automate vendor sales and eliminate inefficiencies and theft that are often found are fairs, concerts and other enthusiast events.